Route Sierra de las Nieves – Quejigales country house – Ronda road. 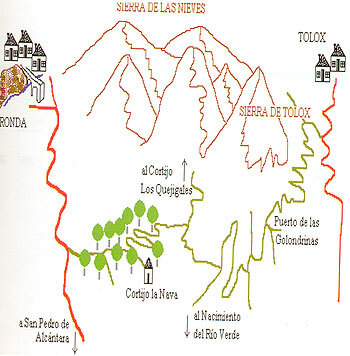 The trekking route will take place along a forest track, through a Nature Reserve in the Sierra de las Nieves. From The Quejigales country house, we shall walk northwards in order to reach a track wich makes its way to a mountain pass; the track becomes smooth among the mountains. Farther on, we will arrive at a junction wich to the right makes its way to some country houses, but we must take it to the left in order to get to Sierra Hidalga. The track at this point becomes very steep. When reaching the summit we must walk on towards a television relay and then climb down to the foot of the hill.